The Department of Defense (DD) Form 254 “Contract Security Classification Specification” provides a contractor (or a subcontractor) the security requirements, classification guidance and handling procedures for classified material received and/or generated on a classified contract. The Federal Acquisition Regulation (FAR) requires that a DD Form 254 be incorporated in each classified contract, and the National Industrial Security Operating Manual (NISPOM) (4-103a) requires that a DD 254 be issued by the government with each Invitation for Bid, Request for Proposal (RFP), or Request for Quote (ROQ). See the below guide for preparing the DD Form 254 for more information. 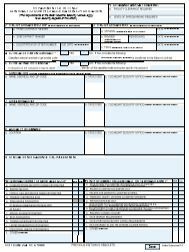 The DD Form 254 is required to be reviewed every two years. The program should conduct this review in coordination with the program manager of the requiring activity and contracting office to ensure that existing security requirements are consistent with the contract requirements. If the review is performed and no changes are required, the program will provide the Contracting Office with a copy of the review. The Contracting Office will then send to the contractor, in writing, notification that the DD Form 254 remains valid until the next review or a change occurs in the program. If the review is performed and changes are required the program and ISS must provide the Contracting Office with a revised copy. The Contracting Office will then prepare a bi-lateral modification to the contract incorporating the new DD Form 254. Revisions to the DD Form 254 will be completed whenever the security guidance or pertinent information changes, or when a change in mission occurs impacting the contract, to ensure security requirements remain current and relevant throughout the contract lifecycle. This includes contractor address changes if they are performing classified work at their facility.